Man-made landforms survey and mapping of an urban historical center in a coastal mediterranean environment. This paper documents the evolution of the urban geomorphological setting of the historical heart of the city of Genoa (Liguria, Italy). Since the Middle Ages, the city and its harbour have progressively grown, reaching their greatest extent in the 1950s. Today it has an area of 8.5 km2 and it includes seven small catchments with surfaces ranging from 0.5 to 2.4 km2. Their urbanized surface ranges from just less than 30% up to more than 80%. Human interventions have almost completely reshaped and modified the original morphology. The identification of artificial landforms built over the former natural landforms was carried out through multi-temporal cartographical and photographical comparison, and the analysis of geo-thematic cartography and documentation by the Basin Master Plan (Piano di Bacino) and Genoa City Hall Plan. In addition stratigraphy data from the regional database were analysed and several geomorphological surveys were carried out in the area. 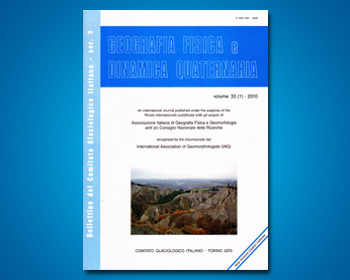 Artificial landforms were mapped by applying an experimental geomorphological classification currently being developed by the Working Groups of the Italian Association of Physical Geography and Geomorphology (AIGEO). The main geomorphic modifications are: slope fillings retained by walls (mainly due to roads and buildings); excavation areas (often connected to historical quarries); sea embankments (for harbour growth) and artificial modifications of the drainage network (culverts, stream diversions and canals). All of these reduced the flow sections. These morphological changes have significantly increased the geo-hydrological risk in Genoa, which is currently one of the most emblematic Italian case studies for recurrent flood events, especially in the light of the modified rainfall regime due to recent climate change.